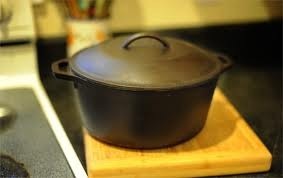 By now you know that I destroyed my treasured Le Creuset Dutch oven last week while trying to learn to cook “Southern”. 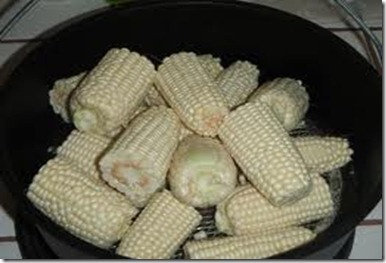 My girl friend, Brenda, helped me locate a replacement and gave me a few tips on cooking “the Southern way” which I never bothered to learn in my young and flighty days. On one of our flea-market excursions, we stumbled across this wonderful cast iron Dutch oven ($25 as opposed to $275 for the Le Creuset). The black iron version had never been used, so it required some seasoning, but I’m back in business. 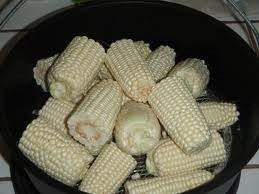 On its maiden voyage, ole Dutch boy was the vessel of the Gods – simmering to perfection sweet corn fresh from the field. I can’t think of anything I could do to destroy this sturdy beauty. Sitting beside my Le Creuset (which is now my garbage bowl) the black iron Dutch oven looks stoic and impervious to my tendency to destruction. I guess I’m a black iron skillet wench of a girl instead of a Le Creuset debutante. Today, Brenda is teaching me how to cook turnip greens in my new pot. Le Creuset would never look comfortable wearing a mess of greens anyway. This entry was posted in Food & Entertainment and tagged Cooking with cast iron, Giving up on Le Creuset by Emily Jones. Bookmark the permalink.